Germany has generally been credited with exercising a large degree of influence over the EU’s response to the euro crisis. But how accurate is this narrative in reality? Drawing on a new co-authored study focusing on key Eurozone reform proposals, Magnus Lundgren explains that the average negotiation success of states was surprisingly balanced. While the economic woes of the crisis were certainly unevenly distributed, the steps taken to resolve the crisis left no states as unequivocal winners or losers. Does this narrative withstand scrutiny? Data gathered within the EMU Choices project allow for an empirical test. The data record the preferences of all member states on all key reform proposals that made it to the negotiation table, such as the European Stability Mechanism and the Fiscal Compact. By comparing the original preferences with the negotiated outcome, one can calculate which countries gained or conceded the most. In striking contrast with the conventional narrative, the EMU Choices data show that there were no clear winners and losers in these negotiations. Across the 39 issues studied, the average negotiation success – understood as whether or not a country gets what it wants at the negotiation table – was surprisingly evenly distributed (see figure below). Contrary to the notion that large countries such as Germany dictated the outcome, negotiations appear to have been marked by compromise and logrolling. Most countries achieved some of their goals; no country got its way all the time. Within this relative symmetry, there are slight differences. As seen in the figure, member states categorised as old (above the median EU membership length) and large (above median population size), Eurozone members, and Southern members fare less well than members who are new, small, remain outside the Eurozone, and are located in the North or the East. The data suggest a few possible explanations for the observed patterns. Member states with more centrist preferences and who sided with the Commission were more successful. Qualified majority voting underlined these tendencies even further. These findings are testament to the importance of institutions and institutional rules in shaping negotiation outcomes in the European Union. 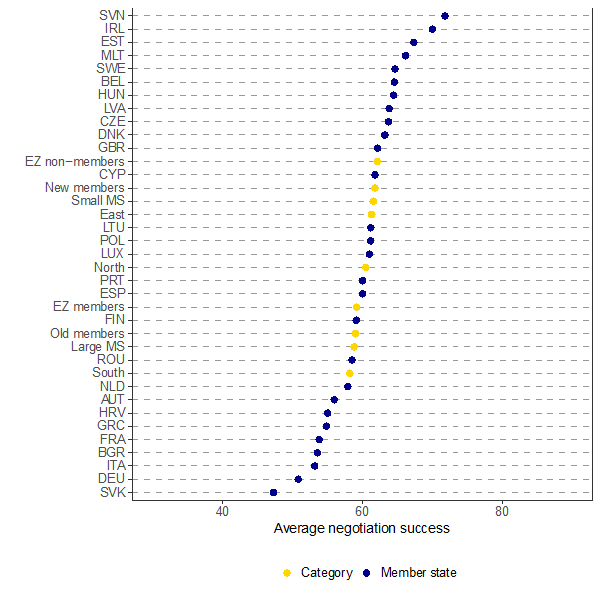 Surprisingly, the three large countries in the Eurozone – Germany, France, and Italy – all rank low on this measure of negotiation success. Why did the most powerful countries not achieve their desired outcome? Three possible reasons present themselves. Firstly, it may be that larger member states were neutralised by their deep commitment to the euro, which opened them up for exploitation. Germany’s lack of a credible exit strategy may have undermined its leverage in these negotiations. Secondly, it appears likely that larger member states exercised influence by shaping the issues up for negotiation, even if they were less successful at the negotiation table. There is some evidence that larger countries engaged in this type of agenda setting. Thirdly, larger member states often held extreme preferences, which forced them to give more ground as the parties converged on common solutions. Since these negotiations appear to have been marked by compromise and reciprocity, this factor is likely to account for a considerable part of the lower negotiation success of larger countries. Overall, the data gathered within the EMU Choices project indicate that power does not dictate outcomes at the EU negotiation table. This has been found in previous research, but it is noteworthy that it extends to a realm of negotiations so central to national interest, and which has been viewed as heralding a profound shift in European power dynamics. This pattern sets the EU apart from some other international negotiation settings, such as global climate governance and global economic governance, in which power resources have been shown to matter. These results also speak to concerns about legitimacy in the EU. Some researchers have pointed to the detrimental consequences for the normative and perceived legitimacy of the EU if some states were systematically and disproportionately more influential in determining policy outcomes. A consistently asymmetric distribution of gains and burdens would challenge normative principles of fairness and could undermine public confidence in the EU as a political system serving the collective interest. For many, the Eurozone reforms have been seen as the epitome of an unfair process and outcome in which self-interested creditors have called the shots and suffering debtors have been forced to accept what they can get. The EMU Choices data shed a different light on this issue and should assuage some fears of poor legitimacy. While the economic woes of the crisis were certainly highly unevenly distributed, the steps taken to resolve the crisis reflected a balancing of gains and concessions that left no states as unequivocal winners or losers. Magnus Lundgren is a Researcher in the Department of Political Science at Stockholm University. Two comments. 1. 39 negotiations isn’t really a very big statistical sample. By my reading of the figure, Germany got its way in (about) 20 out of 39 negotiations, Cyprus, (which is just above the “New Members” point) in 24 out of 39. By my calculation (chisquared) this is a very long way away from being a statistically significant difference (p = 0.49!!). 2. In any case, the significance is almost certainly distorted because it is unlikely that all the decisions in the 39 negotiations were independent variables, there will have been topics where the negotiations were grouped together, so that there may have been an topic leading to (say) 5 separate negotiations, where Germany was on one side, the “New Members” on the other, where Germany lost, leading to a big loss for Germany, but actually only one topic where Germany was defeated. 3. As the article correctly points out, this is only looking at one stage in the decision making process. As the article states, it is possible that Germany exerted more influence at the prenegotiation-phase, or (which isn’t mentioned by the article) Germany deliberately put forward propositions which it knew would be defeated, so to provide material for compromise and getting what it wanted on other issues. This is great research, EMU Choices early data gathering has proven very useful now. My concern is not about the results of the research, but in that, although there are legitimacy claims to be made of these outcomes, the detrimental effects to EU legitimacy are already established and irreversible, even if they were based on a false perception (that most of us had).